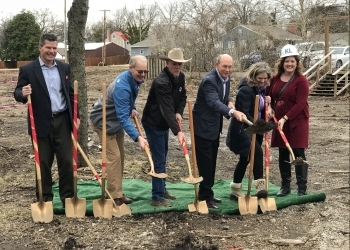 Bartlesville KLIFE broke ground for their new 8,000 square-foot activity center that will house the youth organization's programs. Michele Robertson with Cable One and her husband Mark helped lead the way to make the $3 million facility possible on the 1.6 acres at 1815 Hillcrest Drive near the Bartlesville High School. Michele shared her excitement for the future of KLIFE. She says the groundbreaking symbolizes a bright future for their ministry. In the past, KLIFE didn't have enough space to accomodate for their weekly clubs and small groups. This new building will allow KLIFE to meet the needs of their students, especially considering the fact that the Bartlesville High School houses all four years. Michele would also say that the staff at KLIFE hopes the students look forward to coming to the new facility when it is complete. The foundations and groups that helped raise the funds for the building were on hand. Mark Robertson recognized them at the groundbreaking ceremony. One of those groups includes the Lyons Club, who Mark mentioned gave them $1 million dollars. The Mabee Foundation, The Parsons Foundation, the Bartlesville Community, former KLIFE students, Community Development Director Lisa Beeman and others were also thanked during the ceremony for their contributions. Dan Keleher Architects has been creating the designs for the project. John Gorman and Gorman Construction will be in charge of constructing the building. They were also in attendance. Gorman says construction will have to wait until final architecture designs are complete. Those plans could come to Gorman in a few weeks. Construction will still have to wait for awhile as Gorman reviews the plans. We will have more on the progress of the building in the days to come.